OnTheMarket.com, launched in January 2015, is a new, agent-owned property portal featuring hundreds of thousands of properties to buy or rent across the UK. With over 2,500 local and national agents signed up to the new service and growing, potential home seekers benefit from exclusive content, no advertising and a clean, uncluttered design supporting a quicker property search. 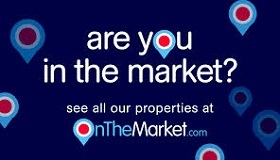 Users of OnTheMarket.com will also benefit from access to new properties before the competition. Properties will exclusively appear on the site 48hrs before they appear on other portals, making it the place to go to view the newest properties to come to market. More and more agents are joining every day and an increasing number are choosing to list their properties exclusively. Butler & Stag is proud to be part of this cutting-edge new website, which is dedicated to presenting properties beautifully, clearly and accurately. Whatever your interest, if you're in the market, visit OnTheMarket.com today and set up a property alert, so you are first to see new properties as they come on the market.